Our affordable and long lasting range of PVCu entrance porches are guaranteed to provide a warm welcome to your home. Constructed to provide added insulation and create a warmer entrance to your home, our UPVC entrance porches are practical, eye catching and unique to you. SGK offer a range of entrance porches in high quality, lead free PVCu, to create you a welcoming entrance whilst at the same time adding value to your home and providing you with additional space. SGK are your PVCu entrance porch specialists. We offer a range of roof designs such as pitched roofs, flat roofs, gable roofs, hipped, ridged and much more. We can also help you choose your bricks and tiles. We can also advise you on what will be better for your porch walls, such as dwarf walls or even full height. Make a fantastic first impression with a new entrance porch. With entrance porches being regularly used in the home by the whole family it is the place for boots and shoes, bags, outdoor clothing, pushchairs and more. 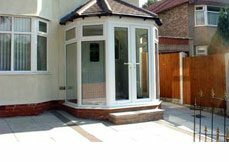 SGK Home Improvements know that in creating you your ideal entrance porch, it needs to be well constructed, warm and secure. We incorporate our advanced energy efficient PVCu windows and doors to make all of this possible. Let SGK take care of all the details. Let our many years experience in crafting stunning and functional porches take the hassle away. We will take care of the design, building work, base work, foundations, electrics and flooring. Generally porches do not require planning permission, but if they do in your own area, we can help take care of that for you as well. If you want to benefit from the latest generation aluminium porches, please contact us. We're here to help you find the right products to enhance your home. Please get in touch if you would like any advice about home improvements.